Aspidistra elatior, the cast-iron-plant or bar-room plant, also known in Japanese as haran or baran (葉蘭) is a species of flowering plant in the family Asparagaceae, native to Japan and Taiwan. Tolerant of neglect, it is widely cultivated as a houseplant, but can also be grown outside in shade where temperatures remain above −5 °C (23 °F). It is used as training material for the seika form of ikebana. Growing to 60 cm (24 in) tall and wide, it is an evergreen rhizomatous perennial, with glossy dark green leaves 30–50 cm (12–20 in) long, and fleshy, 8-lobed cream flowers with maroon colouring on the inner surface, borne in early summer. According to a study published in 2018, A. elatior appears to be mainly pollinated by fungus gnats (Cordyla sixi and Bradysia spp.). Although sometimes thought to be of Chinese origin, the species is in fact native to Taiwan and islands in southern Japan including Kuroshima, Suwanosejima and the Uji Islands. It occurs in association with overstorey species such as Ardisia sieboldii and Castanopsis sieboldii. Aspidistra elatior is well known in cultivation and has a reputation for withstanding neglect, giving rise to its common name of cast-iron plant. It is tolerant of low light, low humidity, temperature fluctuation and irregular watering. It is best situated in a position away from direct sun to avoid leaf bleaching. Good drainage is also required for optimal growth and to avoid root rot. Widely grown as a house plant, it can also be grown successfully outdoors in shade in temperate climates, where plants will generally cope with temperatures down to −5 °C (23 °F), being killed by frosts of −5 to −10 °C (23 to 14 °F) or below. The species is not seriously troubled by insects, but mites and scale may cause occasional problems. Its leaves and roots may be subject to browsing by hoofed mammals such as deer, as well as rodents and rabbits. ^ a b "Aspidistra elator". World Checklist of Selected Plant Families. Royal Botanic Gardens, Kew. Retrieved 2013-07-22. ^ "Aspidistra elatior". Germplasm Resources Information Network (GRIN). Agricultural Research Service (ARS), United States Department of Agriculture (USDA). Retrieved 4 January 2018. ^ Suetsugu, Kenji; Sueyoshi, Masahiro (2018-01-01). 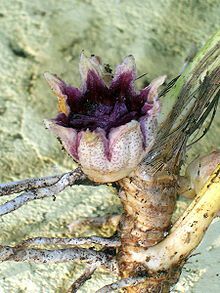 "Subterranean flowers of Aspidistra elatior are mainly pollinated by not terrestrial amphipods but fungus gnats". Ecology. 99 (1): 244–246. doi:10.1002/ecy.2021. ISSN 1939-9170. ^ a b "Aspidistra elatior". Flora of China. Retrieved 2009-02-19. ^ Sako, Shizuo; Katsutoshi Maruno (March 1983). "Flora of Island Kuroshima, Pref. Kagoshima, Kyushu" (PDF). Bulletin of the Kagoshima University Forest. 11: 33–61. ISSN 0389-9454. Archived from the original (PDF) on 2011-07-18. Retrieved 2009-02-20. ^ Sako, Shizuo; Hidenobu Kirino (March 1980). "Flora of Isl. Suwanose-jima, Isls. Tokara, Ryukyus" (PDF). Bulletin of the Kagoshima University Forest. 8: 19–53. ISSN 0389-9454. Archived from the original (PDF) on 2011-07-18. Retrieved 2009-02-20. ^ Sako, Shizuo; et al. (March 1988). "Flora of the Uji Isls., Kagoshima Pref., Kyushu" (PDF). Bulletin of the Kagoshima University Forest. 16: 83–108. ISSN 0389-9454. Archived from the original (PDF) on 2011-07-18. Retrieved 2009-02-20. ^ a b c "Aspidistra elatior". PlantFinder. Missouri Botanical Garden. Archived from the original on 4 March 2009. Retrieved 2009-02-19. ^ a b c Brown, Bob (2013). "High Flying Aspidistras". The Garden. 138 (1): 62–65. ^ "RHS Plant Selector - Aspidistra elatior". Retrieved 4 June 2013. Wikimedia Commons has media related to Aspidistra elatior. This page was last edited on 27 January 2019, at 14:03 (UTC).